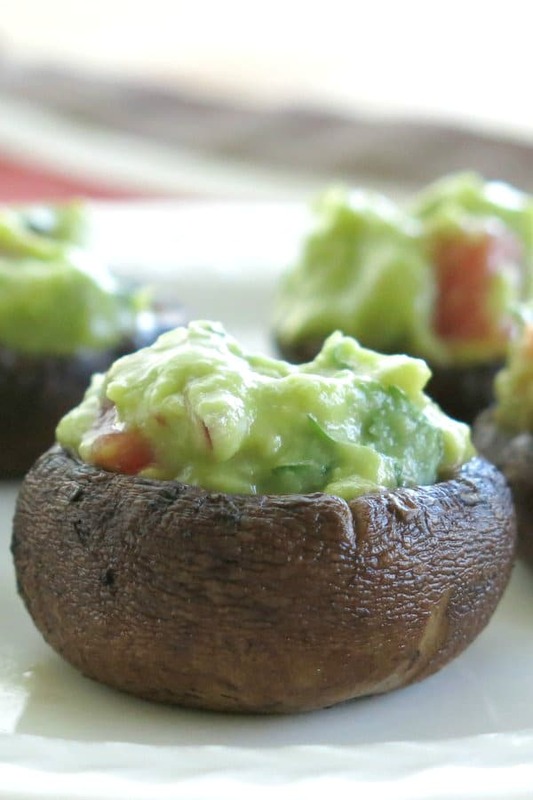 Guacamole stuffed mushrooms make perfect sense if you’re watching carbs, eating clean or just looove these foods. I do and I’ve got some tips that will make this tasty combination easy to enjoy any time. This little gem of a recipe for guacamole stuffed mushrooms was just too good not to share right away. It’s similar to Guacamole Stuffed Deviled Eggs in pairing good old guacamole with another healthy ingredient…this time it’s mushrooms. All of the above…then this recipe is for you! It just so happens I can check all of the above boxes right now. That’s how these stuffed mushrooms came to be. It’s got the creamy texture I’ve come to expect in this kind of appetizer, but it’s oh so healthy! Start with good guacamole. You can follow my Simple Guacamole Dip tutorial or use your favorite recipe. Prep your mushrooms. Gently brush off any dirt with a wet paper towel. Pop out the stem and lightly brush the outsides of the mushroom with olive oil. Bake the mushrooms for about 10-12 minutes in a 350 degree oven or until the mushroom is tender, but still firm. Remove the mushrooms to a serving platter, pouring off any juices that have pooled in the center cavity. Fill the center cavity with guacamole and enjoy! You can cook the mushrooms with the guacamole filling in the center cavity. I like my quac room temperature or cool, so I added it at the end. But, I did try it both ways. Baby bellas or white mushrooms both work great. Check out The Best Way to Keep Guacamole Green by The Kitchn. They recommend adding a thin layer of water over the guacamole and pouring it off when you are ready to use it. I have also placed a piece of plastic wrap on top. But, I usually have to scrape off a brown top layer before I use it. 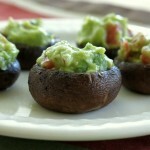 Guacamole stuffed mushrooms are perfect if you are watching your carbs, eating clean or just love these tasty foods. Easy recipe for a healthy appetizer! Lightly brush the outsides of the mushrooms with olive oil. Bake for approximately 10-12 minutes or until the mushroom is tender, but still firm. Remove mushrooms to a serving platter, pouring off excess juices. Fill center cavity with prepared guacamole. Limit portion to 1/2 cup guacamole to keep recipe South Beach 1 compliant. Looks delish and easy to prepare…thanks D<3M ! Thank you! 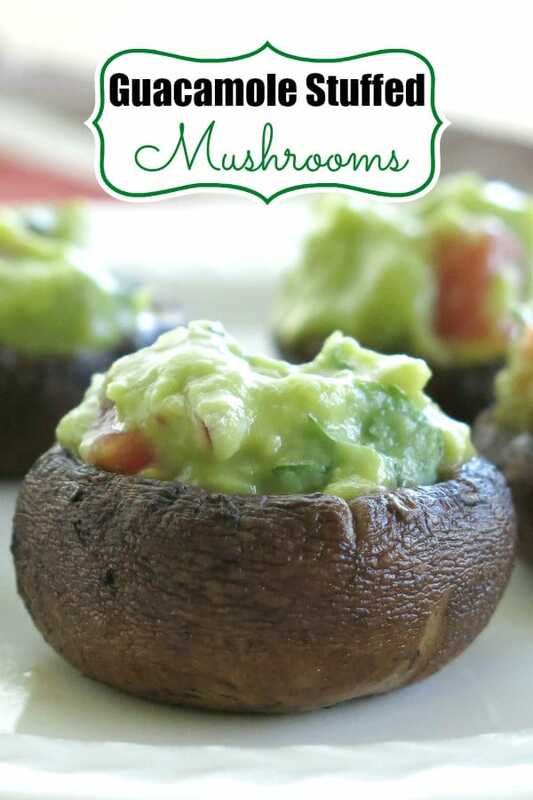 If you like mushrooms and guacamole, you can’t go wrong with this one! You had me at guacamole, I had to come over to see these tasty little morsels!! YUM!! The simplicity of this recipe is unreal! I don’t think I could resist a couple of add-ins, but love the idea! Oh my gosh, I love this idea – so simple and so right! Genius way to enjoy guacamole without chips. 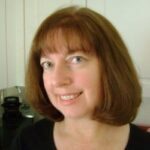 We are doing keto and need more recipes.